Radiculopathy is not a specific condition, but rather a description of a problem in which one or more spinal nerves are affected. The nerve or nerves may be inflamed, had lack of blood flow, or may be affected by a disease in part or totally. Lumbosacral radiculopathy (LSR) is a common clinical problem that involves L5and S1 nerve roots. Late potentials are electro diagnostically elicited responses in muscle that appear more than 10-20 milliseconds after stimulation of motor nerves. They have been termed “late potentials” because they take substantially longer to appear than the direct responses to stimulation of motor nerves. There are two distinct types of late responses, the H-Reflex and the F-response. 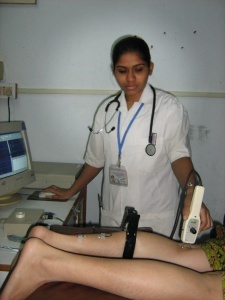 Traditional nerve stimulation techniques used in an electrophysiology laboratory primarily assess the distal segments of the peripheral nerves. Methods of testing the proximal nerve segments or the central nervous system include, blink reflex, F wave, the H reflex, T reflex, tonic vibration reflex, and the silent period. The reflex studies reveal conduction characteristics along the entire course of the sensory and motor axons as well as the excitability of the neuronal pool. Extensive studies have proven the practical value of the H reflex in certain neurologic disorders. Neurologic examination exploits the muscle stretch reflex to measure motor neuron excitability in many conditions. Clinical observation, however, falls short in objectively evaluating the briskness, velocity, or symmetry of these responses. Electrophysiologic recordings offer these advantages by quantifying the response after an electrical stimulation of the tibial nerve. The first type of “late response” was described by Hoffmann in 1918 hence it is named as H-Reflex. The pathway for this reflex and the significance of abnormalities is easiest to understand by recognizing that it is basically the electrophysiologic equivalent of the muscle stretch reflex. The H-reflex is a monosynaptic reflex elicited by sub maximal stimulation of the tibial nerve and recorded from the calf muscle. ↑ 2.0 2.1 Radiculopathy [internet] Available from www.ecureme.com/emyhealth/data/Radiculopathy.asp. ↑ Walk D, Fisher MA, Doundoulakis SH, Hemmati M. Somatosensory evoked potential in the evaluation of lumbosacral radiculopathy. Neurolog. 1992; 42(6):1197-1202. ↑ Abdulwahab S. The effect of reading and traction on patient with cervical radiculopathy based on electrodiagnostic testing . Journal of the Neuromusculoskeletal System. 1999; 7(3):91-96.